Charles Fischer has been an intense fan of the Ducks for over thirty years and has written reports about the football team on numerous internet football boards/blogs for over 20 years. Known as “FishDuck” on those boards, he is acknowledged for providing intense detail in his scrimmage reports and in his Xs and Os play analyses. 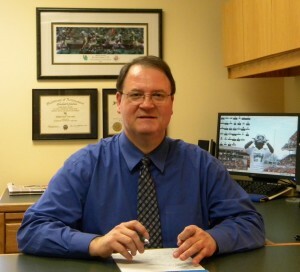 He works for Calton & Associates has been a Financial Advisor for 34 years serving clients in eleven different states. His work in asset management is complemented by workshops presented to churches and charities showing retired people how to leave Planned Gifts for their favorite organization. He has set up millions of dollars in Planned Gifts for Non-Profits by using strategies with a donor’s investments, insurance vehicles, or IRAs which frequently are much more effective and simpler than the usual approach of a bequest through a will/trust, charitable gift annuities or charitable trusts. 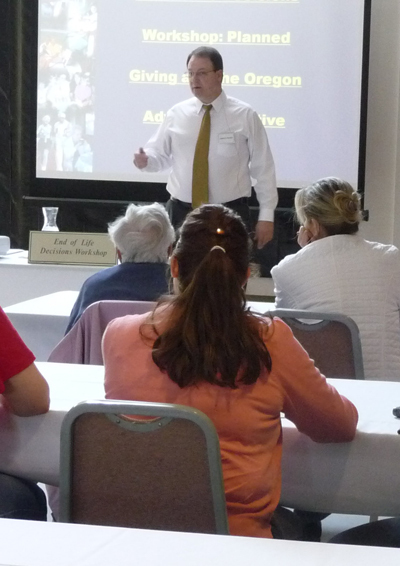 Charles has added to his workshop the dimension of helping Christians learn how to complete an Oregon Advance Directive correctly (which deals with End-of-Life Decisions) while staying true to their faith. He has been active in Church Leadership over the years as he served on Finance Committees, Administrative Councils, Parish Councils, and as Director of Development for over a dozen years. He has had experience running Stewardship Campaigns, Capital Campaigns for Building Projects, as well as setting up Planned Gifts for churches and other charities. He also led two groups in forming Foundations to support those churches, thus he has had extensive familiarity in dealing with the Church/Charity Finance issues that we all contend with. He and his wife Lois, a daughter, Christine, and their dog (Abbie) reside in Eugene, Oregon. Between his asset management work for clients, three sets of workshops per year for charities, and staying well versed in his interest of College Football—Charles maintains a full schedule. Would you like a second opinion on your Investments or learn more about Planned Giving? Charles Fischer is a Registered Representative of Calton & Associates. Member FINRA/SIPC and he is located at 1500 Valley River Drive Suite 315, Eugene, OR 97404 541-687-2062. Calton & Associates. Branch Office is located at 10205 Westheimer Rd,. Suite 500, Houston, TX 77042 (713) 266-2993. All information herein has been prepared solely for informational purposes, and it is not an offer to buy or sell, or a solicitation of an offer to buy or sell any security or instrument or to participate in any particular trading strategy. Charles Fischer, and Calton & Associates do not make any representations or warranties as to the accuracy, timeliness, suitability, completeness, or relevance of any information prepared by any unaffiliated third party, whether linked to this web site or incorporated herein, and take no responsibility. All such information is provided solely for convenience purposes only. Charles Fischer, and Calton do not endorse, control, or receive compensation from any of the third party advertisers or referenced parties within this website. Charles Fischer, and Calton are not affiliated with any of the firms or entities listed unless specifically stated.